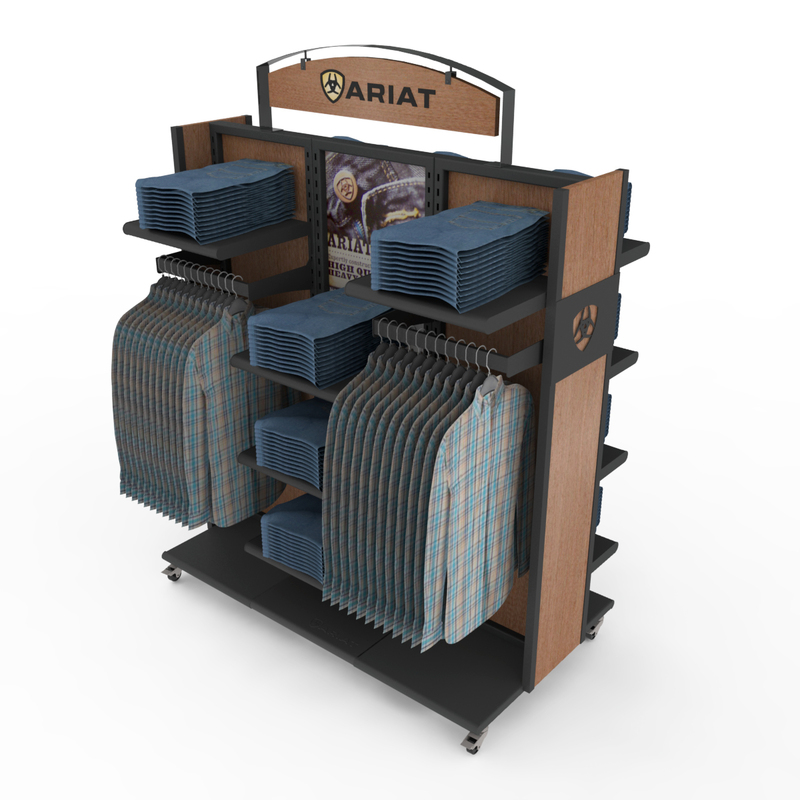 As we have described in some of our recent blogs, we see huge value in creating collections or families of fixtures to help brands respond to retail opportunities and maximize sales. 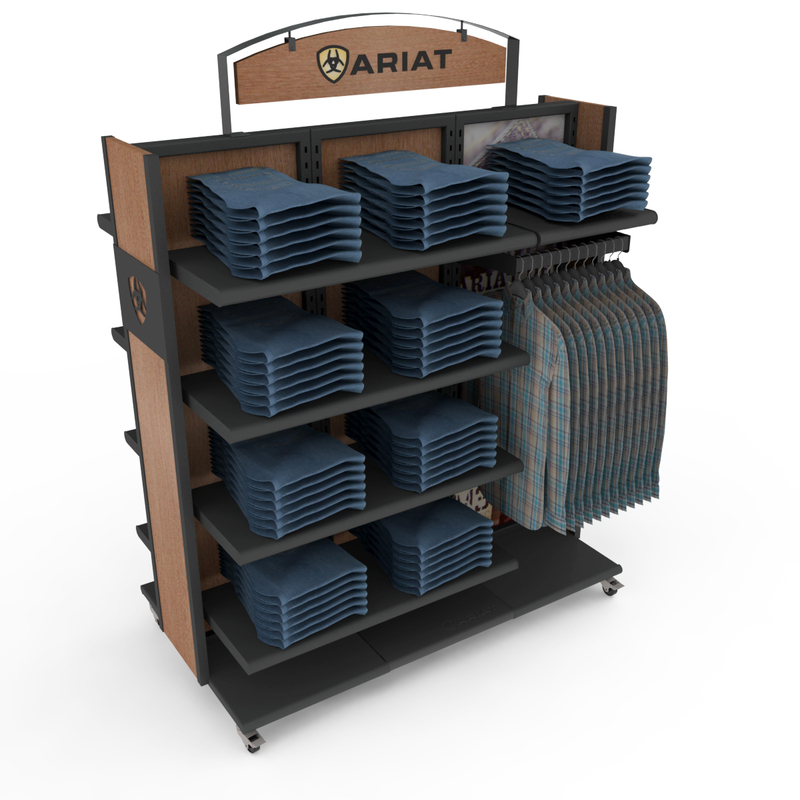 In this blog, we’ll share the design work we did to create a collection of apparel fixtures for Ariat. 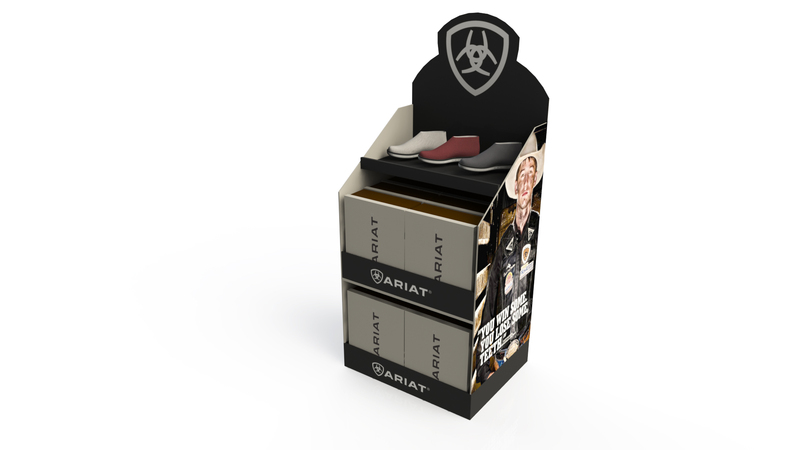 Ariat makes high performance footwear and apparel for the world’s top equestrian athletes. 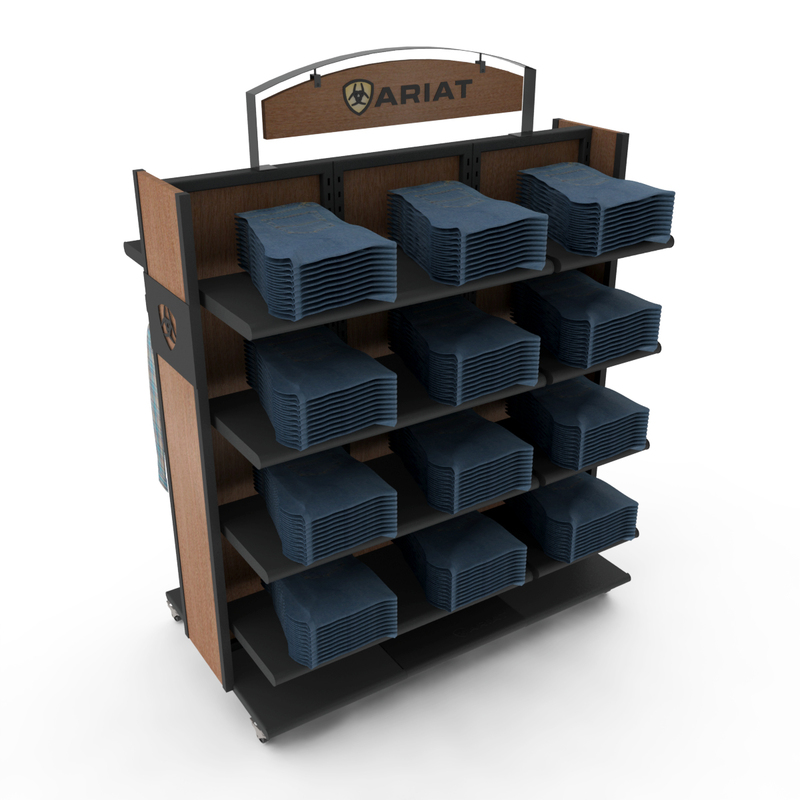 The first fixture we designed was a modular and configurable floor merchandiser. Constructed of a metal tube frame and sheet metal base on castors, the display featured 3 interchangeable center and 2 MDF end panels with a wood laminate finish. We created a drop-in PVC graphic for one of the center panels. 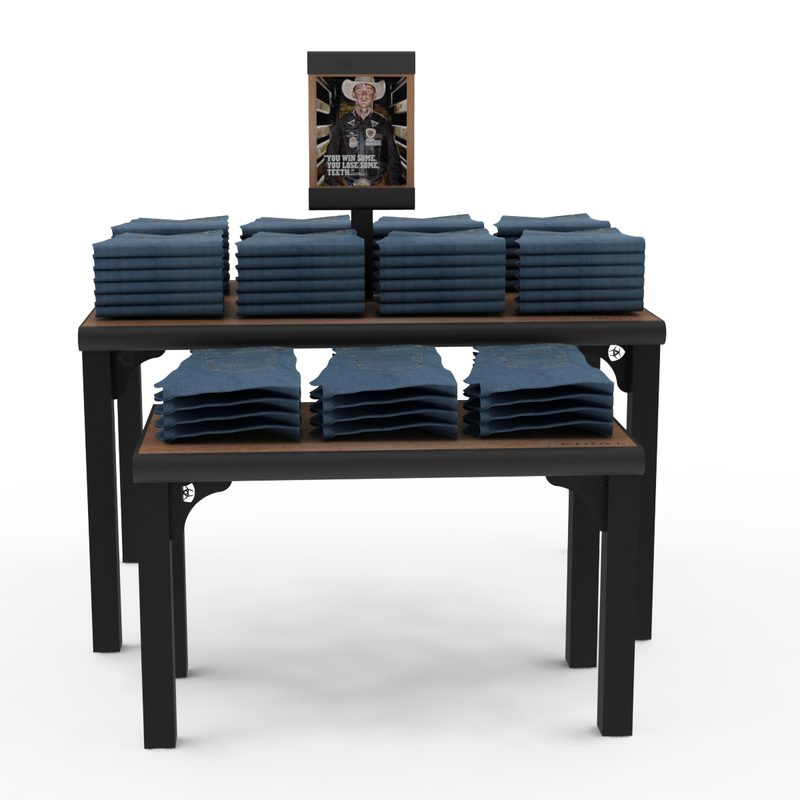 In addition, we added apparel bars to hang jeans and created adjustable shelves for folded garments. We designed laser-cut sheet metal logo plates for the end panels and a decorative hanging 2-sided header sign with a matching wood finish and 2-color silk screened unit. The entire fixture was designed for knock-down construction and easy assembly. The image below shows the same fixture with different accessories and a different product mix, which helps to illustrate the versatility of this fixture. Similarly, the three images below show how easily the fixture can be reconfigured to merchandise a variety of different product mixes by simply changing out accessory components. The second fixture we designed was a set of two nesting tables. We designed these with matte black powder coated frames and solid wood table tops. 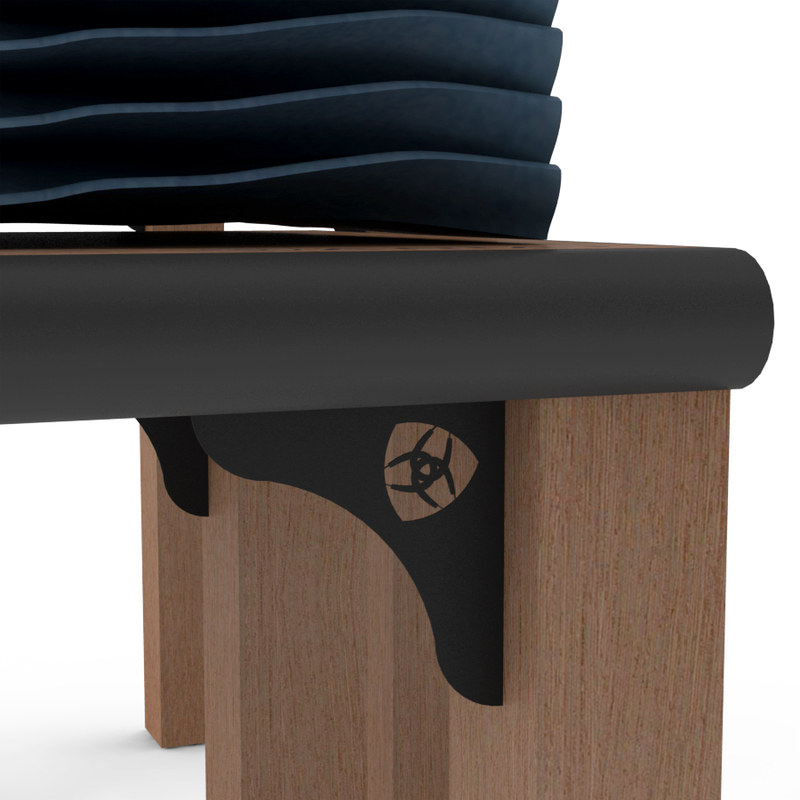 We created one of the versions with solid wood legs and laser cut sheet metal logo accents as shown in the close-up image. 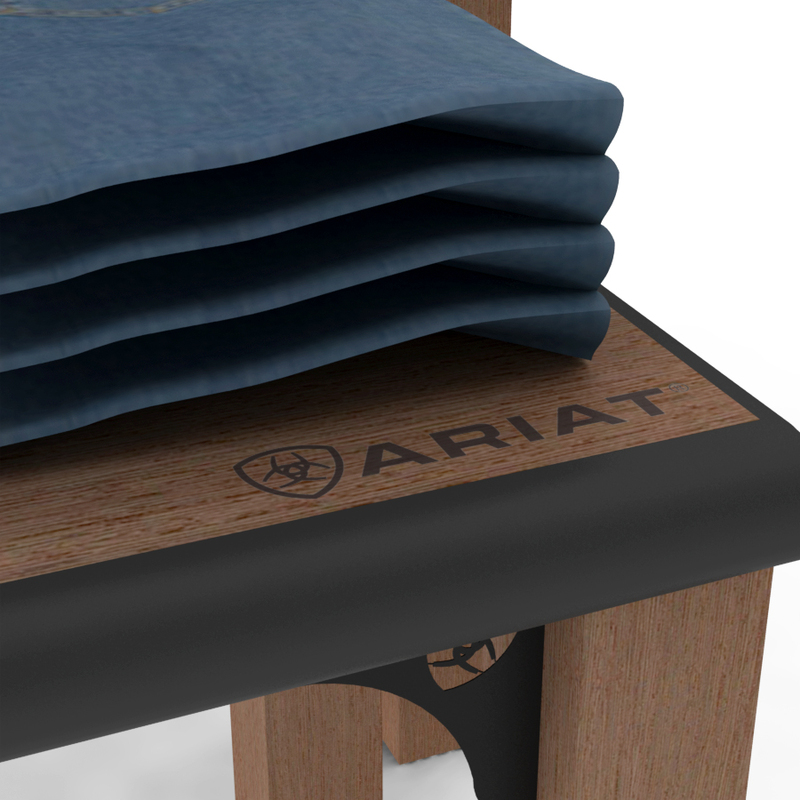 The second close-up image shows the Ariat logo silk screened on the wood table tops. We also designed a table top sign with a 2-sided interchangeable graphic. 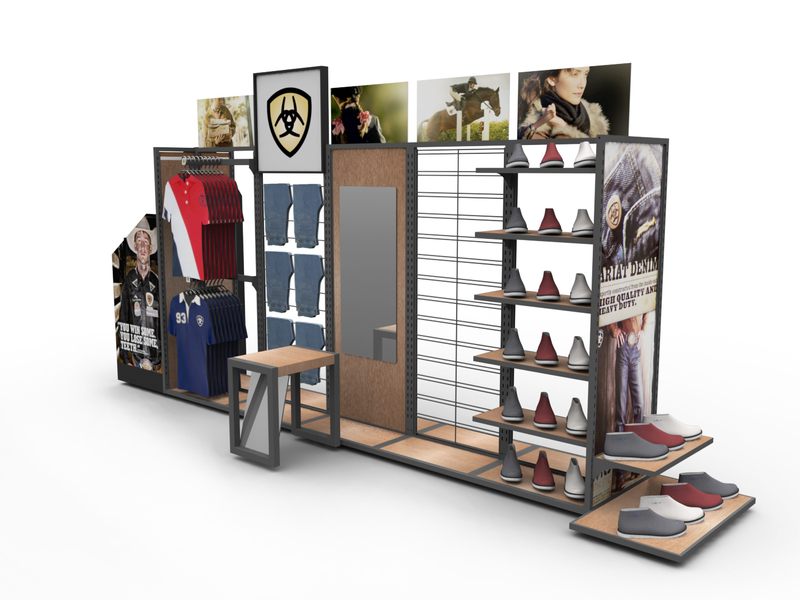 In addition to the nesting tables, we designed a full-length apparel and footwear wall fixture. The fixture was designed with a metal structure with wood inserts and a combination of grid and hanging crossbar components as well as shelves. 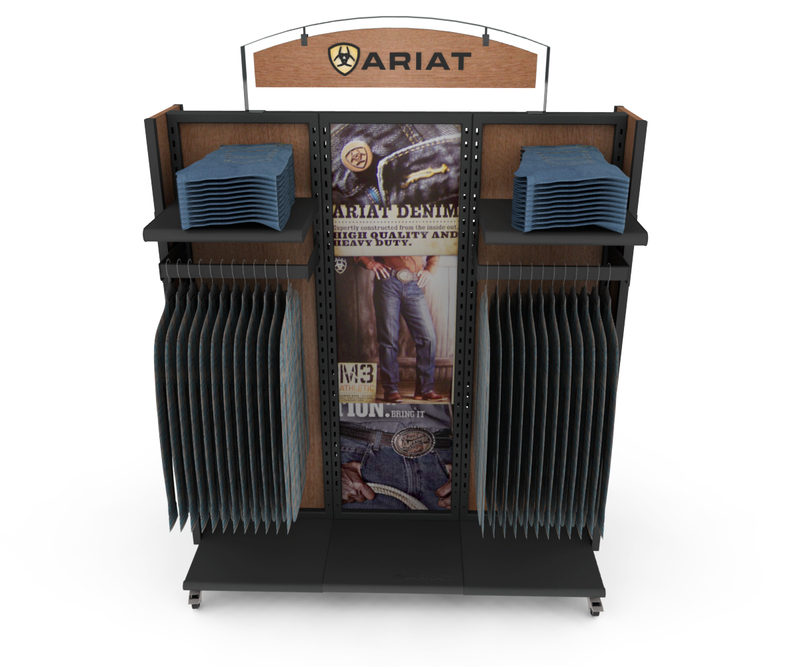 We incorporated a full length mirror, an accessory bench with a slanted mirror, and heavy lifestyle and logo graphics to promote the Ariat brand. The image below shows a different angle of the wall fixture. One of the key design features of the wall fixture was the unit’s modularity and configurability. For example, any one section could stand alone as shown in the 2-sided fixture below. 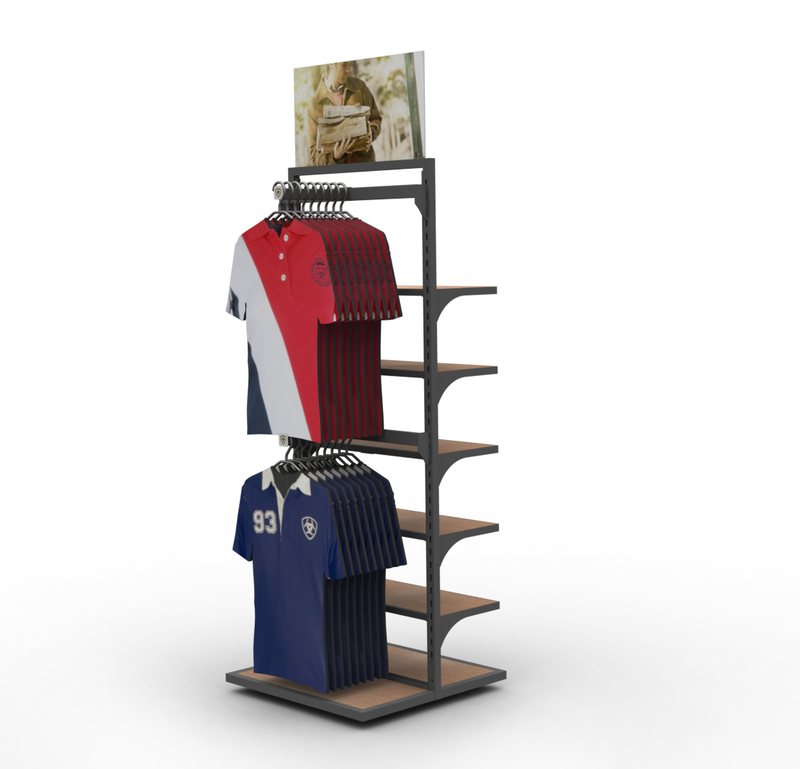 One side of the fixture was used to merchandise shirts, and the other side features shelves were used to display footwear. The 2-sided header was constructed of a digitally printed PVC graphic which was easy to change. 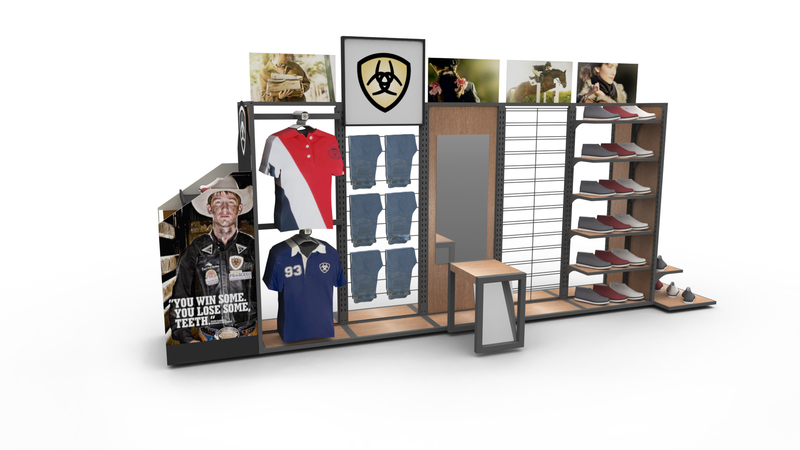 We also designed a corrugated footwear display which included a die-cut logo header, a glorifier shoe shelf, front logo graphics, and side litho lifestyle graphics. In addition to the corrugated display, we designed solid wood block merchandisers to hold boxed footwear. 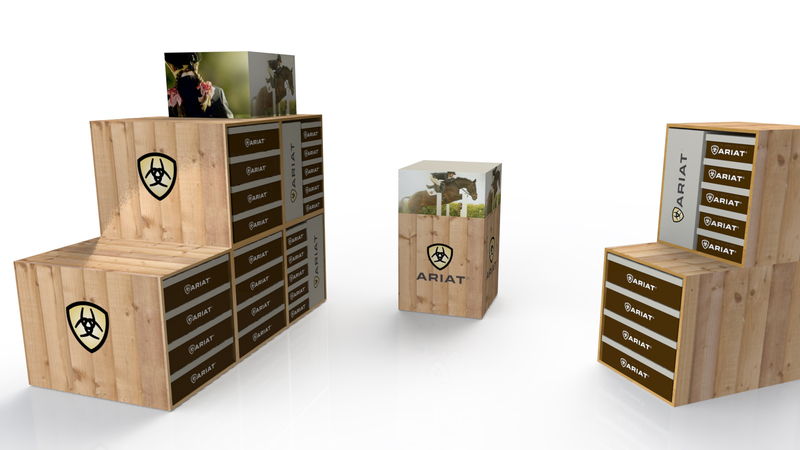 The blocks were designed to be stackable and included heavy Ariat branding and inspirational lifestyle graphics. 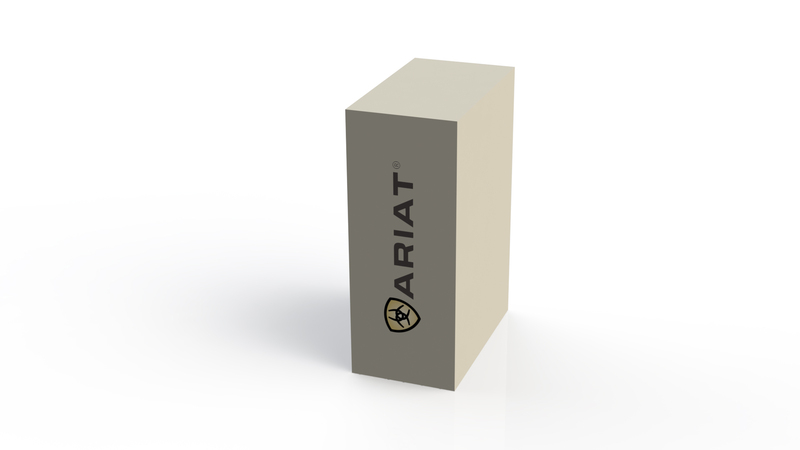 Finally, as a part of Ariat’s high-end branding program, we designed MDF logo blocks which could be used vertically or horizontally on fixtures to help reinforce the brand. 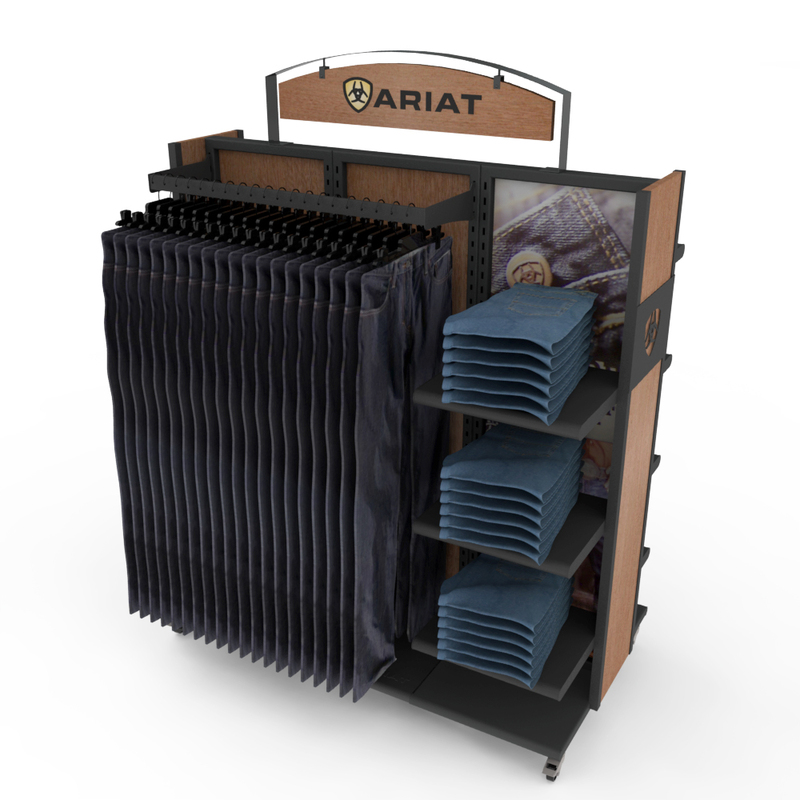 The Ariat fixture program was designed to offer a wide range of fixture options to retailers, all of which were intended to represent Ariat as a high-performance, world-class brand.